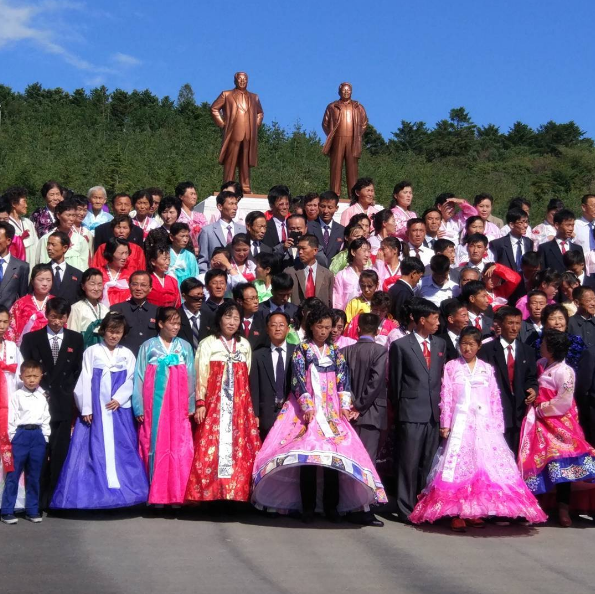 Without a doubt one of the top tours of the DPRK tourist season, the birthday of President Kim Il Sung is the biggest celebration of the year. We expect this to be a huge celebration with fireworks, mass dancing, possibly parades and a number of other events that will most likely be announced much nearer the time to mark the 107th anniversary of the President’s birthday. During the tour we’ll explore the must see sights of Pyongyang such as the Korean War Museum, ride the Pyongyang Metro, a 360 degree panoramic view of the city from the Juche Tower, visit the Mausoleum where Kim Il Sung & Kim Jong Il lay in state, explore Kim Il Sung Square and much more. Aside from the special events linked to the birthday of President Kim Il Sung, our short tour takes you , as well as all the other sites that are a must see whilst visiting the DPRK . For those with the energy, this is the perfect time to do an extended tour, with those on Group B we’ll take you to the iconic Panmunjon DMZ, site of the separation of Korea for a day tour with our own local North Korean officer. 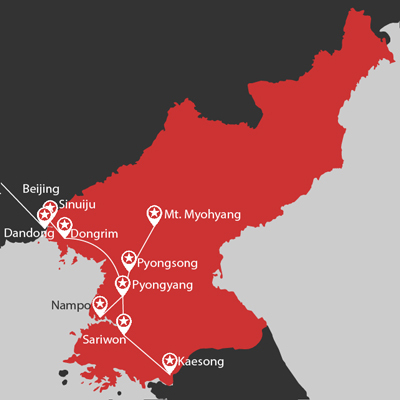 We’ll then head south west of Pyongyang visiting the beautiful city of Nampo and a therapeutic hot spa resort nearby on the west coast, as well as a factory, a farm, and a tour of one of the lesser visited cities. 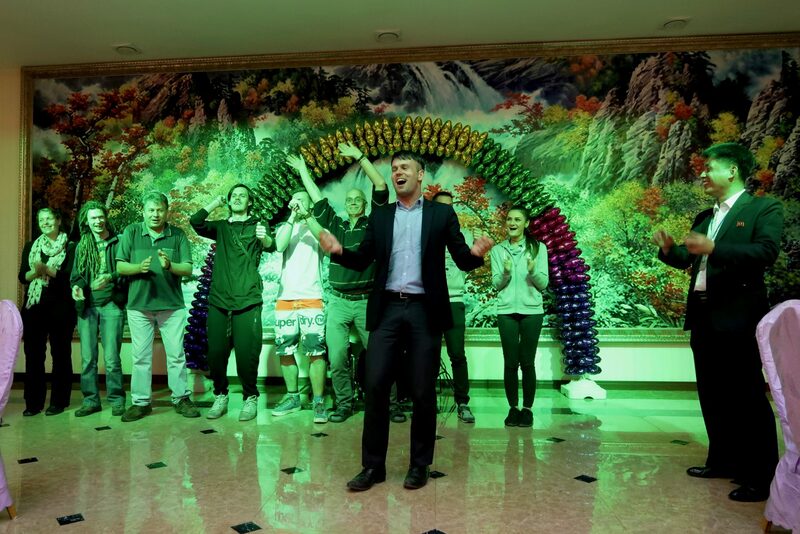 Our super long spectacular tour for Group C takes us to Mt Myohyang where the astonishing Friendship Exhibition is built into the mountain and holds gifts presented to both Kim Il Sung, Kim Jong Il and Kim Jong Un from other nations. We’ll also stop by the recently opened Pyongsong city to visit the local schools and museums, but also stopping on the way to enjoy the scenic countryside and some of the smaller towns. To further spice up the tour, Group C will be making a group tour debut to Sinuiju, the border town of the DPRK located next to Dandong in China across the Yalu River. We’ll be taking the domestic train from Pyongyang up to Sinuiju and to be the first group to stay at the Dongrim Hotel in a small city just outside of Sinuiju. 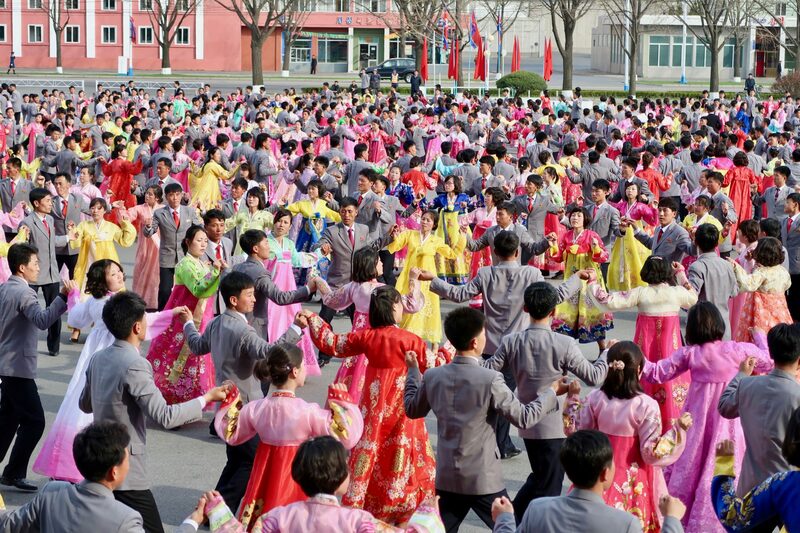 We’ll then be visiting the Pomhayanggi Cosmetics Factory, Sinamri Co-operative farm, a local Folklore Park where you can engage in traditional Korean activities with the locals, and to watch a performance done by the Bonbu Kindergarten. This is what we believe to be one of the most exciting tours of the year. So don’t risk losing your spot and enquire now to secure your holiday to the DPRK. Flight takers depart Beijing Airport Terminal 2 on Air Koryo. (Group will meet at Air Koryo check in counter). Flight departure times will be announced closer to the departure date. To avoid any inconvenience we recommend for you to arrive in Beijing the day before to better prepare yourself. Check in and overnight at Yanggakdo hotel. Kumsusan Palace of the Sun – Former office of the President, this building is now where the Leader’s Kim Il Sung and Kim Jong Il lay in state. Lunch at the Korean Hot Pot Restaurant. The recently renovated Victorious Fatherland Liberation War Museum – with captured American weapons and vehicles, displays and dioramas from famous battles and much more! USS Pueblo – the only US Naval Vessel held captive by another nation and the centre of a major incident in 1968. 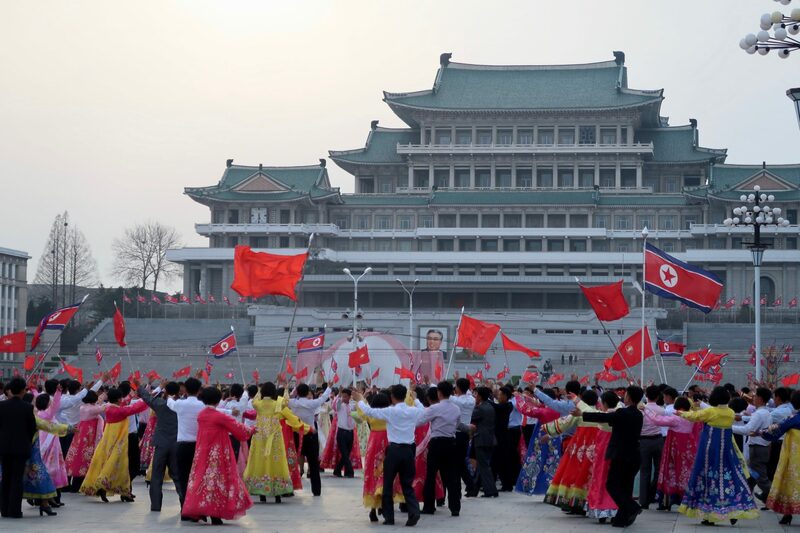 Kim Il Sung Square – the central square of Pyongyang city and the place where all the action happens. Pyongyang Metro – ride 6 stops on the famous Pyongyang Underground! Helicopter Joyride option – we’ll drive to Pyongyang Airport for a VIP lunch (included) and board a Mil Mi-17 to take on a joyride for a 40 minute aerial tour of Pyongyang city. Lunch at the Moran Hill Chicken Restaurant. 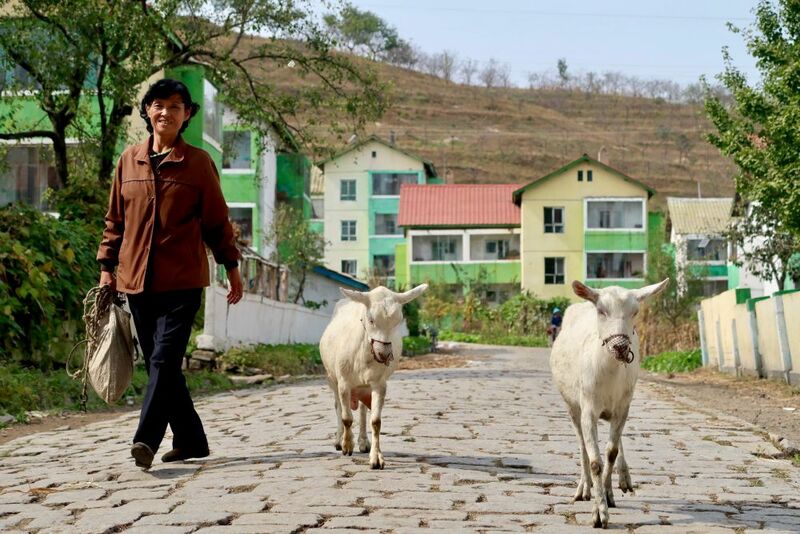 Walk to Moranbong park to drink, dance and celebrate the holiday with the locals. Mangyongdae Native Home – Birthplace of the President Kim Il Sung and where he spent the early years of his childhood. We’ll join the locals on Kim Il Sung Square and watch the fireworks light up over the Taedong River. Group A train members depart at 10:25 am for the overnight train to Beijing and enjoy the peaceful countryside of both the DPRK and China. Train arrives in Beijing Railway Station at 9:00am on Wednesday 17th. Group A flight members depart at 9:00am for Beijing on Air Koryo. (Arriving at 9:55am Beijing time). Up nice and early for the 2.5 hour drive to Kaesong City. Morning walk along the Taedonggang river which divides Pyongyang into west and east districts. Film Studio – over 1000 North Korean films were produced here with backdrops of fake locations such as Seoul, China, Japan and even Europe! We’ll also have a chance to dress up. A gentle hike and BBQ picnic on top of Mt Ryangak to enjoy the magnificent views of Pyongyang city below. Drive to Nampo City – a city located on the west coast of the DPRK. Kangso Mineral water factory – Home to the DPRK’s most famous sparkling water – with samples! Dinner, drinks and overnight at the Ryonggang spa resort with a private mineral spa bath in each room. Here we have an option to have DPRK’s famous BBQ clams for 5 euros extra per person. Chongsan Co-operative farm – One of the top co-op farms in the DPRK and a model example of the co-op method. Lunch at the Pottongang Restaurant. Visit Mansudae Art Studio – where the nation’s most important art work and statues are created. This is where we get to meet some of the local artists too. Overnight in the newly renovated deluxe Sosan Hotel – to experience a different hotel in Pyongyang! We think this hotel is the fanciest in Pyongyang! Drive to Pyongsong – a city which recently opened to foreign tourists located 45 minutes north of Pyongyang. This city is the busiest city in the DPRK outside of Pyongyang. 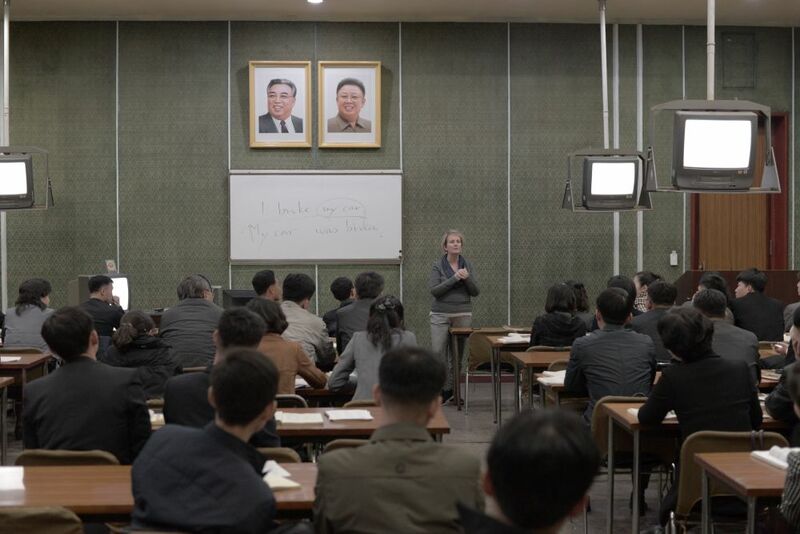 Kim Jong Suk Middle School Number 1 – here you can meet English students and we encourage you to speak and even teach an impromptu class! The central Square of Pyongsong City and Statue of the President Kim Il Sung. Head to Gold Lanes Bowling to play and mingle with some locals – bowling is 2.50 euros per game – here they also have a 4D simulator with locally made virtual movies including one of our favourites that has you in the front seat of a pilot during a battle with an unknown enemy. Group B flight members depart at 9:00am for Beijing on Air Koryo. (Arriving at 9:55am Beijing time). Group B train members depart at 10:25 am for the overnight train to Beijing arriving at Beijing Railway Station at 9:00am on Sunday 21st. Drive out to Mt Myohyang – 2 and a half hours north of Pyongyang. Visit the very famous International Friendship Exhibition – two large gift houses holding the gifts presented to both Kim Il Sung and Kim Jong Il from people, governments and institutions all over the world. Pohyon Temple – One of the five famous temples of Korea and one of the largest Buddhist temples in the DPRK. Drive back to Pyongyang and on the way stopping at Ryongmun Cavern – one of the most famous cave complexes in the DPRK and is famous for its stalactite and stalagmite formations. Head to the Meari Shooting Range which been recently renovated and equipped with rifles, pistols, archery, virtual games and automatic rifles. $0.50USD cents per bullet. 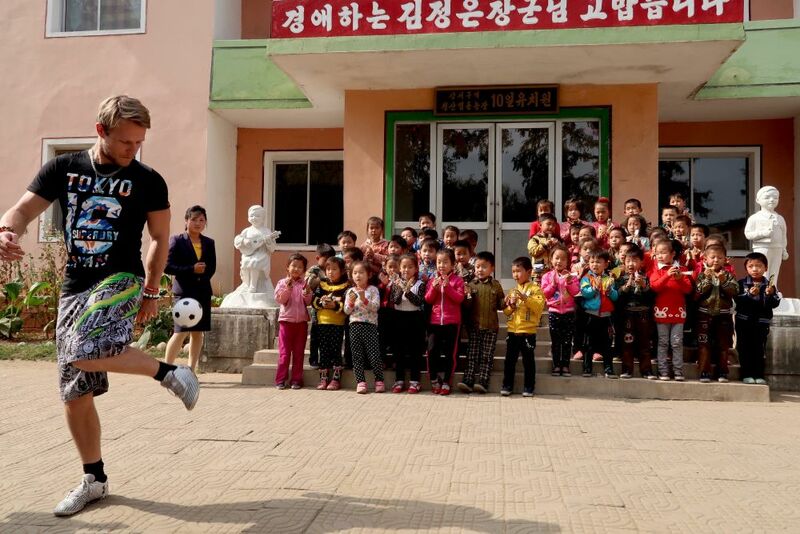 Depart Pyongyang by train at 10:25am and arrive in the remote village of Dongrim at 2:30pm – Dongrim is the nearest town outside of Sinuiju, located south amongst the valleys of the east coast of the peninsula. Visit the mosaic images of the “Three Tigers of Mt. Paektu” Kim Il Sung, Kim Jong Il and Kim Jong Suk. Lunch at a local restaurant which also features a great souvenir shop. Board the 4:30pm bus and go through Korean customs to finish tour in Dandong, China. 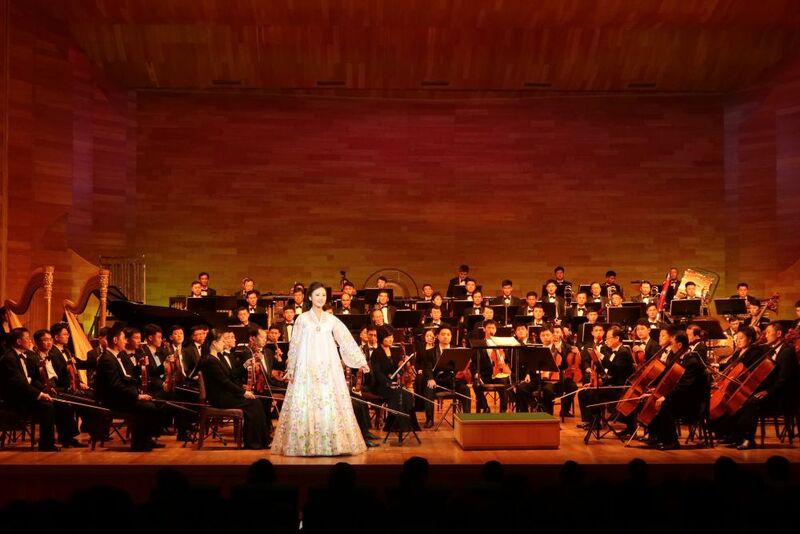 Special events for Kim ll Sung's 107fth Birthday: these may include fireworks, mass dances or special performances. Optional helicopter joyride option - board a Mil Mi-17 to take a 40 minute aerial tour of Pyongyang.